"We are impressed by Moldova's efforts to promote reforms and we encourage you to continue. 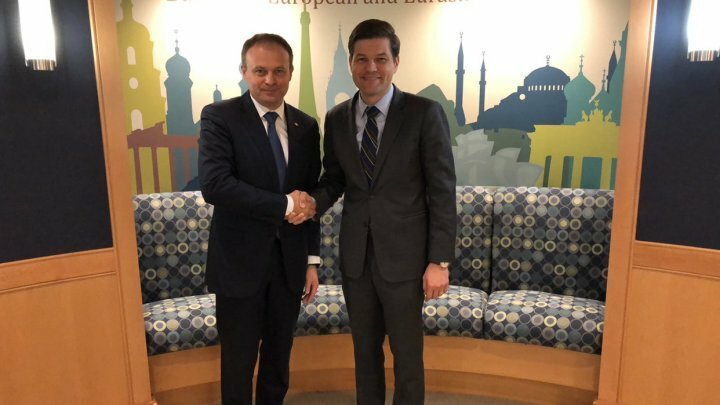 The US will give Moldova the full support for the path towards EU and the US, " said Wess Mitchell, Assistant Secretary of State in the meeting with Andrian Candu, Parliament Speaker. According to the US official, Moldova is at the forefront of geopolitical confrontation. "We appreciate the actions of Moldovan authorities and we will support your country as well as your region", said the US official, Wess Mitchell. Andrian Candu, in turn, thanked the US for support, moreover, the Moldovan official presented the government's actions to ensure the security and prosperity of its citizens. In particular, the Speaker of Parliament spoke about joint efforts with civil society, experts and foreign partners to adjust media law to international standards that would ensure freedom of expression, media independence, and consumer protection of counterfeiting and propaganda. Andrian Candu also reminded the inter-parliamentary conference in March this year, when Moldova, Georgia and Ukraine committed themselves to a common ground in security matters and in European integration efforts. The President of the Parliament communicated about the programs and reforms that come to ensure the debureaucratization of public services, the integrity of dignitaries and officials, good and equal conditions for business development, ensuring the stability of the financial and banking sector and strict rules that prevent and counteract the washing money attempts, as well as several social programs launched by the authorities for equal access of all the inhabitants of the country to health, education, roads, etc.